The Train-nf We decided that were going to view this classic black and white film from 1964 directed by John Frankenheimer and starring Burt Lancaster. We believe we may have seen it at the time but we didn’t remember the details. The setting is in France just before the end of World War II and it was obviously filmed about 19 years after the war ended. Somehow that seems much closer to that war than we had felt it was at the time. The plot is relatively simple. The Germans know that the war is coming to the end and the Americans are set to liberate Paris. A high-ranking German officer wants to transport the great trove of priceless French paintings that they have captured back to Germany. 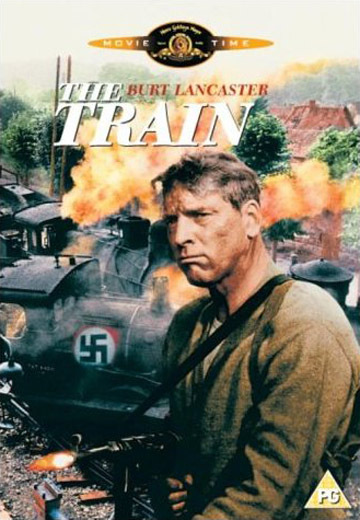 The French underground, led by the character played by Burt Lancaster as a French train expert, has decided to prevent that train from getting back to Berlin. We now realize the story is much more complicated than it may have seemed to us at the time. Lancaster’s character is obviously quite ambivalent about whether it is worth risking and losing any more French lives as the war is drawing to an end. He, in fact, has never appreciated art in the first place although in the words of another character who says that this art which are boxes of Renoir, Picasso, Miro, etc etc, “is an essential part of the French people and their heritage.” This important question surfaces throughout the movie including at the dramatic conclusion when he faces down his German nemesis played magnificently by Paul Scofield who asks him among, all the death and destruction surrounding him, if he really knew what he was fighting for? In fact, we wonder what would have happened if the Germans got the art back to Berlin. Wouldn’t the allies have probably found it anyway? The movie is much more than this philosophical question; it is a classic action thriller filled with suspense, even if you think you know how it is going to work out. There seems to be plenty of what today seems to be computer generated action except there were no computers and very little special effects in the 1960s. The supporting cast are leading French actors of the time who all spoke English while playing natives of their country. This includes the famous French movie star Jeanne Moreau who gets a hug from Lancaster, which is as far as the romance, went in this movie. The screenwriters Franklin Coen and Frank Davis were nominated for an Oscar.